Art doesn't need to shout. It can barely whisper and still touch your soul. But sometimes art makes a big statement in public to get your attention. Here are some giant abstract works of public art found in ArtMoi Public. We've got some classics and some we're sure you've never seen. Click each image to see more details about the piece, such as location and additional photos. This iconic work of public art is actually not a cube as the name suggests, but appears to have been stretched from the top-most point. The striking colour, as well as precarious positioning, makes it stand out amongst the solid, bland buildings surrounding it. Looking through the circular hole in the middle provides a view of the adjacent building, which gives passersby a sense of unity between art and architecture. 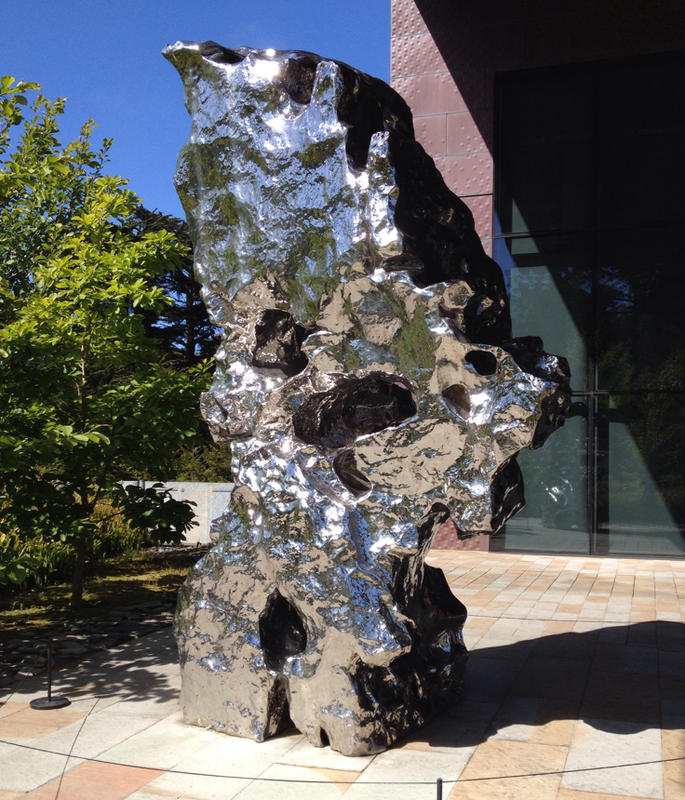 One of China's leading contemporary artists, Zhan Wang, created a series of "Artificial Rocks" that are stainless steel replicas of "scholar's rocks" found in traditional Chinese gardens. The pieces are coated in chrome to create a reflective surface, absorbing the viewer and their environment into the work itself. This piece was one of the first public art works commissioned during the redevelopment of downtown Los Angeles. Originally entitled "Stairway to Nowhere," the sculpture breaks up the monotony of grey buildings surrounding it. The twisted form makes the stairs rising out of the water appear to rotate as you walk around the fountain, giving the art a magical feel. Henry Moore's intention for his massive sculptures was for them to be interacted with, viewed up close, and even touched. This makes them perfect public art works. The tallest of the group is this multi-storey piece made up of 25 steel poles. Despite the very modern and urban look to this abstract piece, the artist said that he was inspired by sticks that washed up on the shore near his home. The artist, who has been called "The Lord of the Rings" created a series of enormous sculptures made of intertwining steel rings. He says that he is fascinated by the idea that shape is a human language, and explains that he finds his pieces more than creating them. He discovers shapes that "sing" to him. "Rondo" is a musical term which implies something repetitive or circular. The Phoenix is a mythical creature symbolizing fire, ash, and rebirth. This giant, fire-red sculpture resembling rising flames, is made of large circular steel parts, alluding to the cyclical nature of a phoenix's life. The piece has a twin made in blue that is located nearby. In response to Gertrude Stein's comment on her hometown Oakland, "there is no there there", Roslyn Mazzilli created this colourful centrepiece for the city. It is now an iconic landmark, enormous in size, and appropriately titled "There." The piece was inspired by nature, somewhat resembling a bird taking flight and flowers blossoming. Finally, Chicago's most famous piece of public act, known by most as "The Bean," stands 33-ft tall. Made of 168 stainless steel plates welded together, the surface is so polished that the entire structure appears to be a giant bean made of one piece. The reflective surface, which was inspired by liquid mercury, captures a distorted Chicago skyline, and is hence an extremely popular photo-op location for tourists.